Water rules the western United States. Not only does it sustain cities, but it also fuels the economy. It’s both a primary source of electricity and the foundation for agriculture. For all that, water is often not available in the Southwest and Intermountain West. To ensure a steady supply, the United States built a series of reservoirs throughout the 20th century. The two largest, Lake Mead and Lake Powell, sit behind massive dams on the Colorado River and provide water and electricity to several western states. 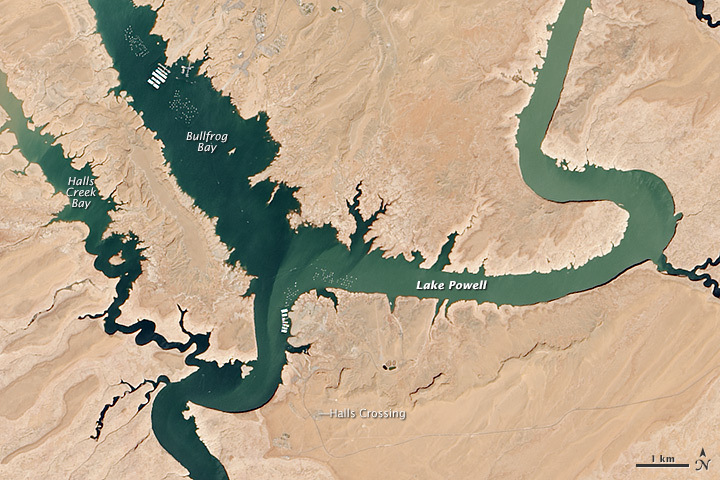 After 14 years of drought, Lake Powell was at 42 percent of its capacity as of May 20, 2014. 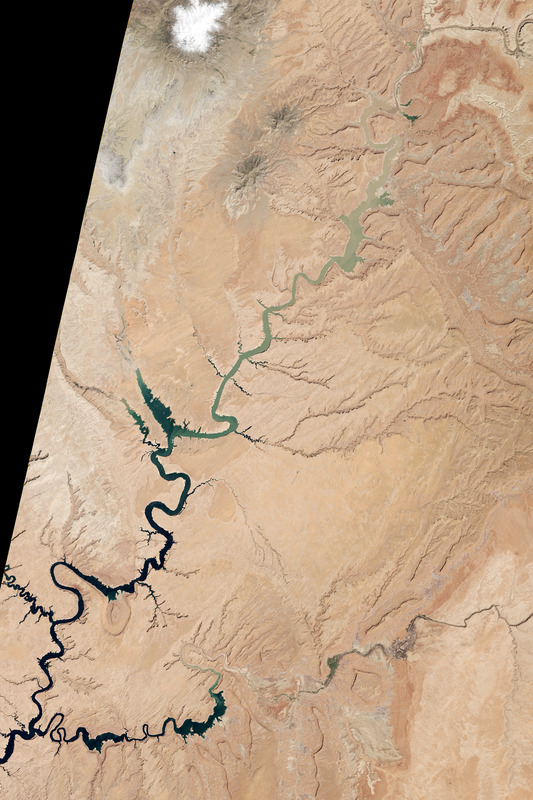 The low water levels are evident in these images, which were acquired by the Landsat 8 satellite on May 13, 2014. White bleached rock show where Lake Powell’s shore is when the reservoir is at capacity. 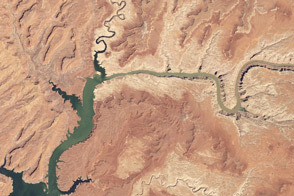 In the top image, which shows the northern section of Lake Powell, a muddy Colorado River flows through a largely empty lakebed. 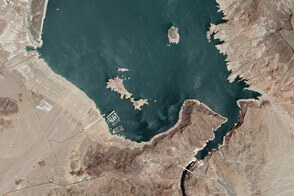 The lower image shows a section of the reservoir closer to the Glen Canyon Dam and popular with boaters. 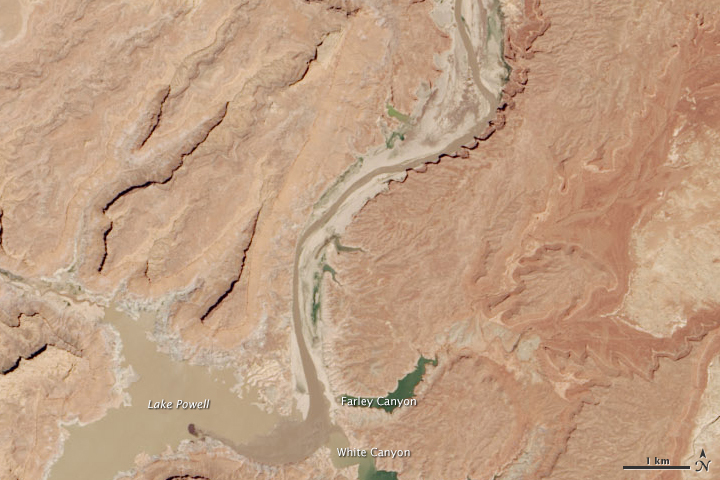 Here, Halls Creek Bay is clearly smaller than it is in the National Park Service map of Lake Powell. It is normal for water levels to fluctuate in the reservoir depending on how much water flows in from snow and rain and how much flows out to meet needs. However, it has been dry in all but three of the past 14 years. At the beginning of 2000, Lake Powell was at 94 percent of capacity. By October 2013 (the beginning of the 2014 water year), water levels had dropped to a low of 50 percent capacity, according to the Bureau of Reclamation, the agency that manages the reservoir. 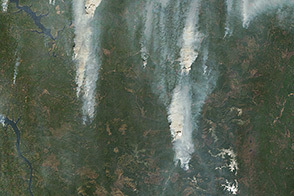 The Earth Observatory’s World of Change shows this annual fluctuation and overall decline. With slightly above average snowpack in the basin that feeds the lake, water levels are expected to rebound to about 51 percent of capacity by October 2014, the end of the water year. While the drop in water levels are worrying for those who generate electricity or use the water for agriculture, the lower water levels may be a draw for recreation. Boaters coming to Lake Powell in the spring of 2014 will find beaches and rock formations that are usually underwater. Bullfrog Bay is the starting point for many boat rentals. The popularity of the spot is evident in the lower image: boats dot the surface of the water, just tiny white flecks at this scale. 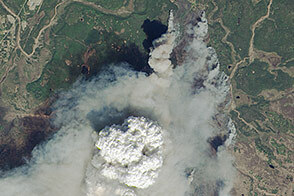 NASA Earth Observatory image by Robert Simmon, using Landsat data from the U.S. Geological Survey. Caption by Holli Riebeek. In spring 2014, visitors to Lake Powell will find beaches and rock formations that are usually underwater. After several years of drought, the reservoir has dropped below 50 percent capacity. Glen Canyon Natural History Association (2013) Lake Powell. Accessed May 21, 2014. Lake Powell Resorts & Marinas The new Lake Powell. Accessed May 21, 2014. 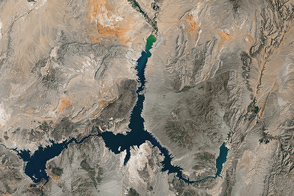 NASA Earth Observatory (2014, May 21) World of change: Water level in Lake Powell. Accessed May 21, 2014. National Park Service Glen Canyon National Recreation Area. Accessed May 21, 2014. New York Times (2014, January 5) Colorado River drought forces a painful reckoning for states. Accessed May 21, 2014. United States Bureau of Reclamation (2011, August) Drought in the Upper Colorado River Basin. Accessed May 21, 2014. United States Bureau of Reclamation (2014, May 9) Glen Canyon Dam/Lake Powell. Accessed May 21, 2014. United States Bureau of Reclamation (2014, May 18) Upper Colorado region weekly hydrology summary. Accessed May 21, 2014. United States Bureau of Reclamation (2014, May 20) Upper Colorado River drainage basin tea-cup diagrams. Accessed May 21, 2014.